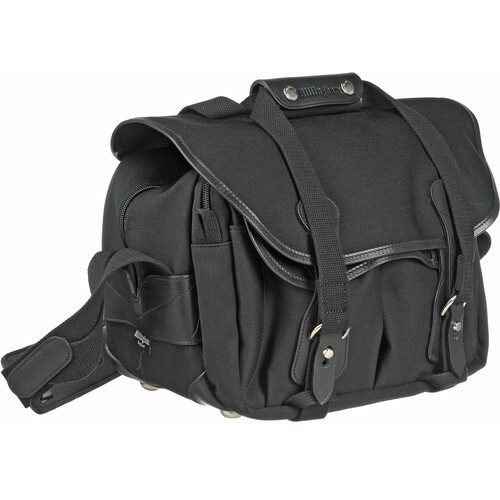 The Billingham 225 Shoulder Bag is designed to carry a digital SLR camera with three lenses and accessories. It is constructed from soft-weave fabric which helps eliminate abrasions, combined with Stormblocker dual-laminate waterproof canvas. The bag has a heavy-duty, closed-cell foam padded interior and a double-laminated, removable hard bottom. In black canvas with black leather trim and green interior lining, it has a Superflex 9-15 partition for separating and organizing the interior. The 225 bag has four interior slip pockets located between the main inner compartment and the exterior, two large front exterior pockets and two pen pockets on the front. It is carried by an interior grab handle that allows the protective cover flap to remain open, or by a leather grab handle that snaps together securely for easy hand carrying. A Delta Sling shoulder strap with a heavy-duty, neoprene-backed, leather shoulder pad provides another transport option. Fully waterproof top flap completely covers the top of the bag as well as the front bellow pockets. Main compartment is framed internally with 4-ply Nytex binding. This maintains the bag's shape and helps to channel rainwater away from seams. The TukTop allows the main zipper, with its double pullers, to be tucked out of the way when opened. Zippered compartment located on the front exterior of the bag has sewn-in padded pockets, which hold filters, additional cords, and connectors as well as a section for a notepad, paperback, or magazine. Box Dimensions (LxWxH) 11.1 x 11.0 x 6.0"
225 Shoulder Bag Black with Black Leather Trim is rated 4.5 out of 5 by 19. Rated 2 out of 5 by john from cumbersome and awkward bag This was my second Billingham Bag. I was looking for a bigger bag to hold my D7000 without removing the grip. While this did fit the fill, it has other issues. First this is a heavy bag for its size. Your shoulder is going to be feeling it after a while. Also the speed straps are not speedy at all. You have to route the straps through the metal ring then attach the strap to the locking button. The bag handle straps get in the way. Also if the front pockets are empty, it hard to quickly attach the strap to the locking button since the entire fronts dip in, not giving you enough a backing to hold it still. If you want to keep going in and out of your bag quickly you have to have the external flap hanging in back of the bag. This means the the handle flaps are also hanging in the wind. Rated 5 out of 5 by photo-enthusiast from Great shoulder bag! I am very satisfied with this bag. I use it at all my day-trips, it be in the city or photo-walking in the mountains. It is very comfortable, and it holds all my gear - 4 lenses, including the nikon 80-200mm 2.8, my flash and my nikon d300 with mb-d10. Rated 5 out of 5 by Anonymous from When you have the best gear it deserves This Billingham is a top of the class bag that comes with an obvious top of the class price. I wouldn't buy this for a $1000 camera system, I'd spend the money on accessories for the camera instead. However since I have well in excess of $10,000 invested in my camera system it only made sense to me to give that gear the best protection possible while transporting it. Exceptionally well made, well padded, and the removable insert pockets are first class as well. I use it primarily to transport my current 1D series body with an attached 70-200mm lens. Has room for some additional smaller accessories as well. If you want to transport a large camera (or two) and multiple lenses you may want to consider a larger version of this bag. Rated 5 out of 5 by Anonymous from 225 Shoulder Bag (Khaki with Tan Leather It was the perfect size for my canon EOS 5D Mark ll and 3 lens until I put the battery grip on so I had to return the bag and get a bigger one. The exchange was easy but of course I had to wait longer for the new bag. Rated 5 out of 5 by Marty from This is one great bag! The 225 is the best bag I've ever owned. It holds my Nikon D300, four lenses(one attached to the camera body), and a flash, as well as assorted accessories. The materials that the bag is constructed of are second to none, and the protection it gives your equipment is about the best there is.It's a little tougher to get in and out of compaired to some other bags because of all the leather straps, but that can also be seen as a plus,because this is a very secure camera bag. I really can't say enough good things about the Billingham 225 shoulder bag. Rated 4 out of 5 by Aunt T from Everything I expected! I found this bag online a while back, but hesitated in ordering it due to price. When I recently upgraded my camera, I needed a really good bag for it and the lenses I've collected. This bag is almost perfect! It is very sturdy and is designed very well. It does take some getting used to, as there are multiple flaps and compartments. But, once you break it in a bit, it is very easy to access gear and accessories. The buckles were a bit stiff when the bag first arrived, and a little hard to open. But, like all good leather, they broke in after just a week or so of use, and now getting in and out of the bag is super easy. Even after loosening up, the design of the buckles keeps equipment very secure when the bag is closed up. I purchased the backpack strap, which works very nicely. It wasn't exactly intuitive, but was very comfortable once I figured out the correct way to hook it to the bag. The only downside I found to this bag is in the included padded inserts. While it is great that you can reposition them, it would be nice if the configuration allowed for two lenses, rather than a lens and a flash. I have not yet figured out the best way to configure the inserts for the gear I want to carry, but am sure I will. For the time being, I have removed them and am using the leather pouches my lenses came in, which works well, too. Rated 5 out of 5 by Steve M from My LAST Camera Bag! Like most bagaholics, I wasted years searching for a great-looking, long-wearing, well-designed, spacious camera bag that doesn't actually look like a camera bag. And as you might imagine, I have a closet-full of bags and back-packs that ALMOST filled the bill. Then I came across the Billingham bag line in early 2012...and my quest was finally over: the 225 is my perfect travel bag. It's been on my shoulder from Paris to Aruba to Hawaii; from Death Valley (at 118 degrees) to Duluth Minnesota (at minus 15 degrees). After more than 3 years of travel, being thrown under airplane seats and squished into overheads, it has never let anything bad happen to its contents -- and it still looks like new. To give you an idea of how the 225 might work for you, here's my go-to travel gear (and everything fits easily in this bag): 1. Camera body (currently a Nikon D7100 with extension battery pack) 2. Super-zoom lens (currently the big Nikon 18-300) 3. Prime lens (Nikon 50mm 1.4) 4. Padded SD card pack 5. Flash attachment (Nikon Speedlight) 6. Several lens filters (polarize/darken) 7. Small quick-charger 8. Extra battery 9. 18% gray card I could easily fit a third lens in the main compartment, but haven't needed one yet. Bellingham has also address that issue of accessibility: the 225 has both quick access and travel setups built-in. When I'm shooting in the field, I just tuck in some flaps and un-snap others, and I can get my camera out in a few seconds. In travel-mode, everything is buttoned up and safe. The bag itself weighs a bit more than most, because it's heavy canvas with leather trim and not cheap nylon. I wanted that material, though, and knew it would weigh more. I'm 65, and it doesn't bother me a bit hanging in cross-body mode. Please don't be too dismayed by the price: this is a hand-made bag that is supremely well-constructed for a lifetime of hard use. IT'S WORTH IT. Rated 4 out of 5 by Tony from Best Camera Bag My wife is looking for a camera bag, which is not traditonal bag(alway black). This 225 bag is pretty match to my Nikon D3 camera + 24-70f/2.8, and one SB900 flash in the main compartment. The should pad is the most comfortable of all my bags. It is not full-weather bag and not raincoat provided. Does the carry handle come off? Will this bag fit a nikon D5300 camera and a nikon 200-500 lens? Does it fit a Nikon D600 with a 24-120 attached plus a 70-200/4, a flash and a 50/1.4 without being cramped? Yikes! As my 225 bag is dedicated to film and specifically holds a Nikon F6 + 3 prime lenses, B&amp;W filters, 6 rolls of Tri-X, Sekonic light meter and some odds 'n sods etc., I'm going to say this guys bag is going to be cramped and restrictive to say the least. Go for the next size up mate..! Ken. Can this fit a Macbook pro 13inch?